If you have been using the Windows operating system ever since the XP or 98 days then you will be familiar with the blue screen that will randomly appear on the screen interrupting whatever software that you are using. 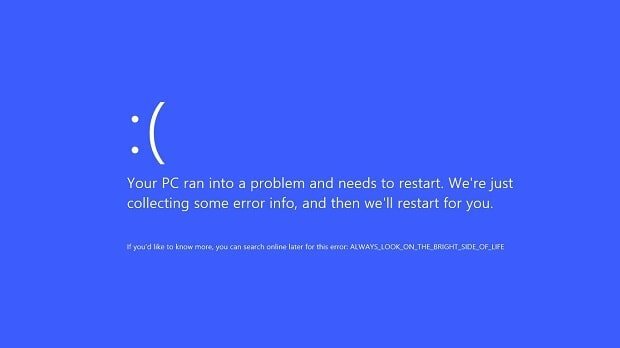 This blue screen is commonly called the blue screen of death and sad to say that it is also appearing in Windows 10. This occurs when a serious error occurs in the Windows operating system which then forces the software to stop completely. While this isn’t really a serious issue since it can easily be resolved it can become frustrating if it occurs when you are working on something and you haven’t saved your work yet. When the BSOD happens in your computer there are several factors to consider that could be causing this problem. It could be due to a driver conflict, a glitch in the software, or a hardware error. The most important thing to remember is to get the error code that can be seen on the screen This code is usually ten characters long starting with 0x. You should Google the exact error code that you are getting to get to know what it is all about. For example the 0x00000051 error code means that a severe registry error has occurred. The first thing to consider whenever the BSOD occurs in your computer is to check if you made any changes to your system. Did you install a new hardware component? Did you install a new software? Did you tweak the software? These new things that you introduce into your computer might be causing this error. Try to undo these changes then check if the issue still occurs. Does the primary partition of the hard drive have sufficient space? As a rule of thumb you should keep at least 15% of the drive capacity free. Scan your system for viruses. Some viruses, such as those that infect the master boot record, can sometimes cause the blue screen of death. Make sure that your Windows 10 has the latest updates and service packs installed. Go to your device manager then revert all settings to default. Non-default settings have been known to cause the BSOD. Try returning the BIOS setting to its default level. Make sure that the hardware components are properly connected. If possible try reseating the hardware components. Make sure that your computer has the latest hardware drivers installed. If you have determined that a software installed in your phone is causing the problem then try reinstalling this software. If you are still experiencing the blue screen of death on your Windows 10 computer even after performing the troubleshooting steps listed above then you should contact us using this form and we will do our best to help you resolve the problem.